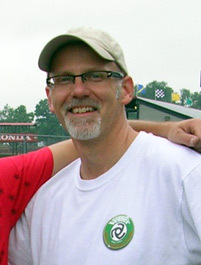 Friday, July 20, 2012: Challengers led by AMA's Dave Hembroff gathered to ride 80 miles around the Ohio countryside making motorcycle history. Fred carried the required groceries. 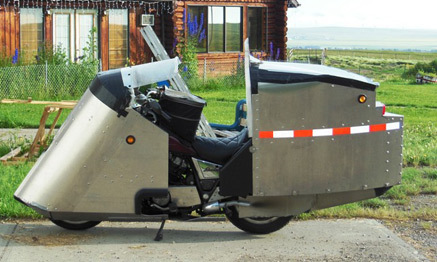 Note the saddlebags. 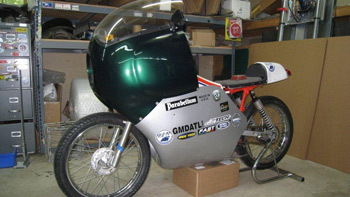 Diesel Fred's comments: "I was only 0.11 cents per mile more than the best electric bike and beat the number two electric, on pump fuel! And I can carry 4 bags of groceries, run in the rain, and travel several hundred miles on a tank of pump diesel that is available at almost any gas station. This is significant! 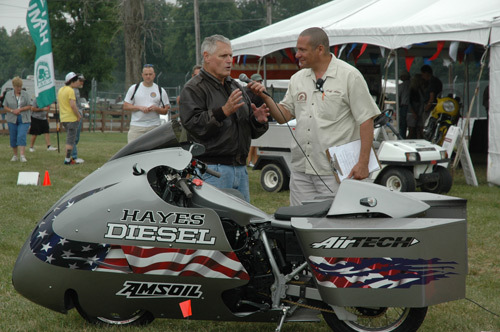 My goal is to consume biodiesel at the rate of 1.5 to 1.6 cents per mile by the Vetter Challenge at Quail next year and get under 1 cent a mile at the AMA Hall of Fame Las Vegas to Barstow Event in November of 2013, all while using biodiesel." Fred Hayes loves a contest and is a great competitor! Mark Gielbien 1.82 cents per mile. This includes paying Ohio road tax. The electric entrants were under the careful watch of Kraig Schultz. The electric machines drove with us for 20 miles. Then they turned around and returned to their rented garages at the Mid Ohio Track to plug into the grid. 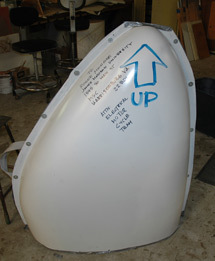 Kraig reports that these prototypes required 4-6 hours to completely recharge, using a standard 120VAC wall outlet. This is real driving in real conditions. 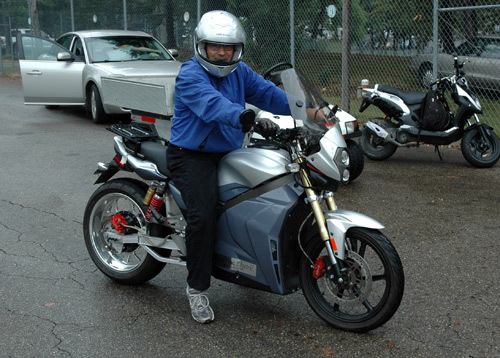 Kraig has posted a very comprehensive web page focusing on the electric bikes. Dale Van de Ven, Hayes Diesel 106.4 mpg 2.57 cents per mile. Dale carried the groceries, too. 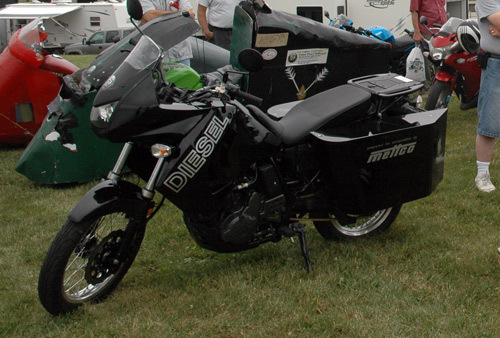 Fred Hayes comments about this Diesel: "I was a little disappointed at the 106 mpg, but I purchased the B100 from a new source in Ohio and I want to test the fuel when I get back. I also learned a great deal about engine setup when running biodiesel in the Quail event and back upped what we learned at this run. I hope to gain 10-20 percent while running high percentages of biodiesel in Craig’s next event. As your designer, I have been telling you that streamlining is one smooth, continuous shape, round at the front... pointed at the back. 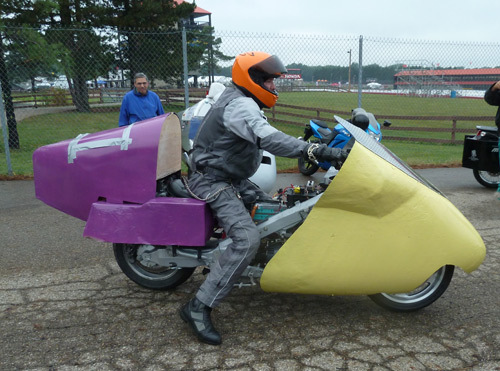 In spite of this, Vic took second place at Vintage days on this "not so elegantly streamlined" Ninja. Huh? What is the story here? 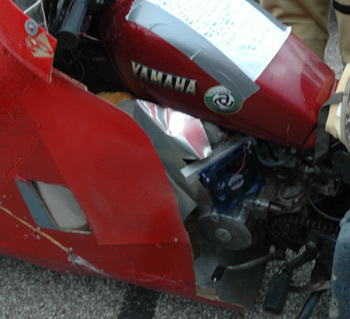 Prior to the Ohio trip, Vic old nose just covered just the fender. With his full nose, he said that his mileage was noticeably better on the trip from California. While Alan Smith, Vic's riding buddy from California, had no problems with the Midwestern heat, Vic had serious overheating problems. Little by little, he cut holes in the new nose until it stayed cool. 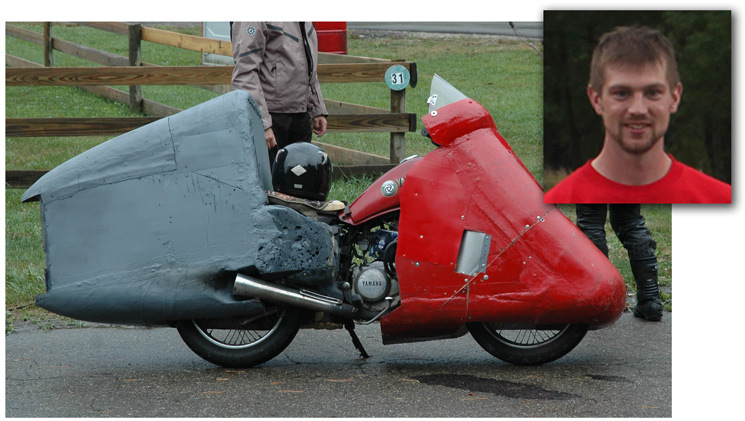 Look at the mess it made to his aerodynamics! His headlight could no longer illuminate the road ahead because of the intake scoop. Vic says he thinks he did well at Vintage Days because of a combination of things: First is weight. He and , Alan Smith, ( 2.8 cents per mile) has a similar Ninja with the Vetter streamlining. They weighed their Ninjas, all up - with them aboard. Vic was 60 pounds lighter. Second, the Ohio countryside riding was slow, slightly rainy, gentle with no wind. Differences in streamlining would not be so dramatic in those conditions. Vic and Alan will be weighing in soon with their comments. I hope they can give us the side by side numbers for their trip from California to Ohio. They would be most meaningful. Electric bikes are cool!! Once the batteries can store enough energy they will rule. 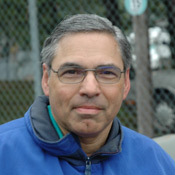 As with Vic Valdes above, if I had not seen it, I would not believe it. Ben could carry the groceries. Ben zipped around fast. Ben had no problem riding freeway speeds. Ben burned gas at the rate of 2.6 cents per mile. That was 108 mpg! My comments: Ben did it! Over 100 mpg. On a budget. Congratulations, Ben. Ben Schloop did this on the same kind of bike that Charly Perethian used back in the 80s, when the speed limit was 55 mph. Contestants in those days did not need to ride comfortably or carry the groceries. Ben has demonstrated that it is possible to keep an air cooled 16 hp engine cool in Vetter Challenge conditions. 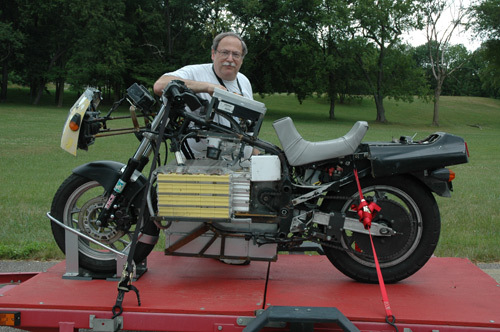 Charly Perethian, winner of last year's Vetter Challenge at Vintage Days on a Honda NX250, was building a new Challenge bike based upon an air cooled TL200 Trials bike. He gave up after seizing it trying to go 70 mph, up a Georgia hill. Charly ran out of time to solve his problems. The fact is, in the 1950s, the standard practise in motorscooters - where the engines were buried deep inside bodywork - was to force air around the cylinder from a crankshaft driven impellor. There are a lot of air cooled 175-200 cc bikes out there. Cheap. But I don't know of any modern, 16 hp fan-cooled engine, driving something with 16" wheels, do you? 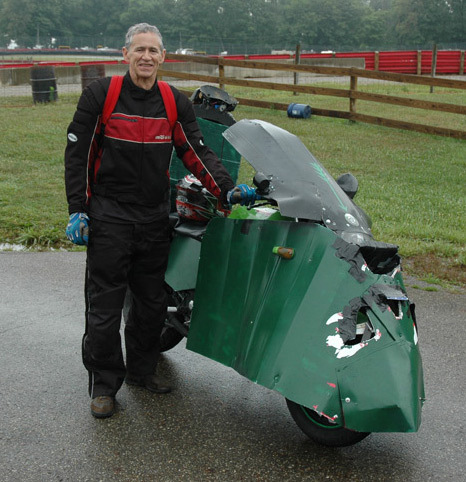 The Ohio Challenge was cool, damp and relativey slow. 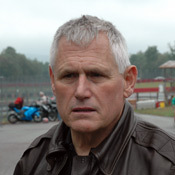 Would a 185-200cc fan-cooled engine be able to sty cool in, say, the Las Vegas to Barstow Challenge? Charly: We all missed you this year. Do you have any opinions on this? 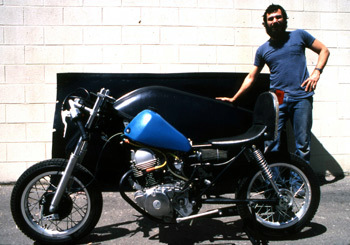 Charly Perethian in 1983 with his SR185 Behind him is the first Rifle Fairing which is still available. 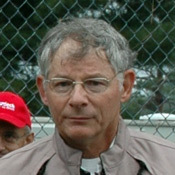 Charly Perethian won the 1980s Vetter contests and the 2011 Vintage Days Challenge. 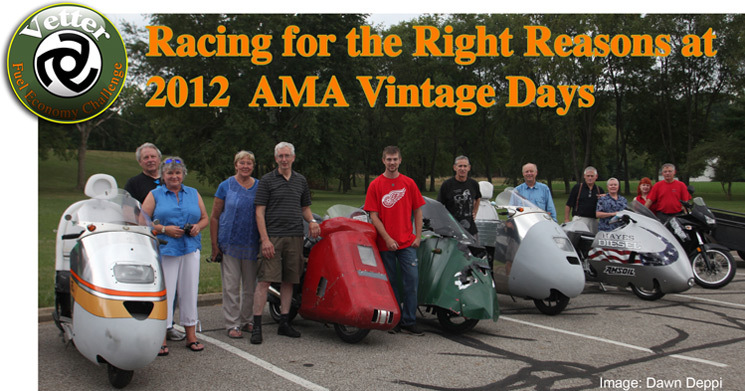 "Like last year I am looking forward to riding my streamlined Ninja 250 again to Ohio in July. With improvements in aerodynamics from last winter’s work I plan to get even better gas mileage or should I say use less gas." "Currently my streamlined Ninja 250 feels over powered. The extra power makes if fun for another ride across the country. 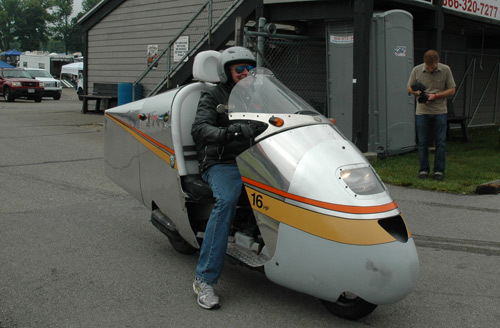 This summer’s ride to Ohio, I should have a couple of other streamliners riding with me. It will be great to compare fuel economy along the way." And what happened to you Mr. Vetter? Well, I took 5th place, consuming fuel at the rate of 3.4 ¢ per mile, or 85 mpg. Last year I got 109 mpg. My streamlined Helix has run poorly for the past 30 days. It has no power. It pops and coughs and uses up its cooling water. I think I blew a head gasket but never had the time to take it apart and find out. I sure looked good, tho. George Voll says: Our team was a semi-finalist in the Automotive X-Prize.Our entry in the mainstream class is a multi-fuel diesel internal combustion engine in a late model production chassis with simple modifications, which will use bio-diesel during the competition. 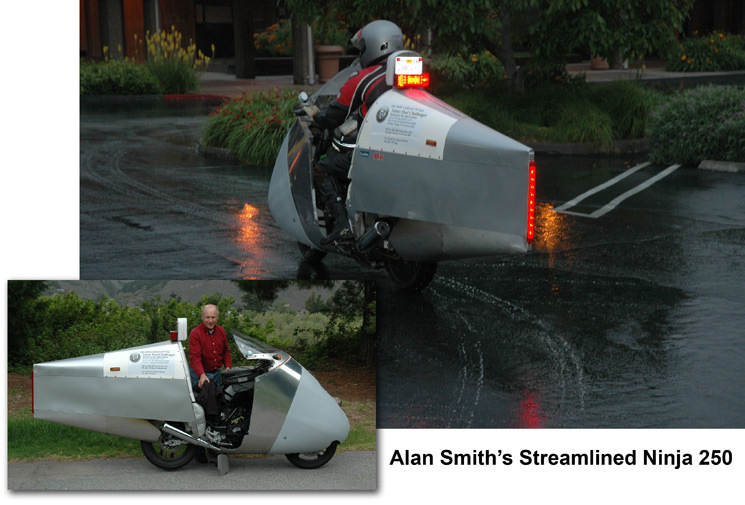 The X Prize entrant got 57.6 mpg, burning fuel at 4.6¢ per mile. 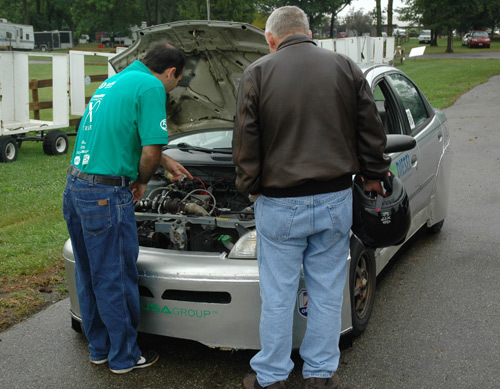 Diesel Fred Hayes learns about the BITW Geo Metro converted to run on B50 bio Diesel. 4 wheelers really are easier to streamline, you know. Our Canadian Challenger Ron Johnston overheated in the US and had to turn back. It is interesting to learn of Vic's improvement enclosing the front wheel, not that it is unknown, but his previous wheel cover was fairly smooth and the improvement was still significant. Fred still spanks. That Diesel tech is just awesome. Excellent showing by all, what a great event! I am guessing that about 10 times a day people took pictures of me and mybike. I am now planing a trip to Los Vegas or Barstow in November 2012 to do the Los Vegas to Barstow Vetter Challenge. So far I have booked the time off work and am looking into buying a new long and tall Sprinter van for transporting the VT500. Interesting bit of non-related trivia: Collectively, we've spent 6 million years of man-hours playing World of Warcraft. Could this time be better spent? How? Electric Joe Ruva was there as promised. 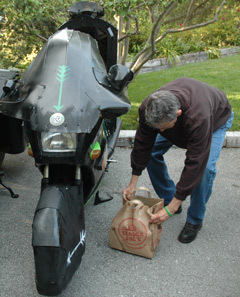 His electric bike looked good, but he did not have tme to finish his fairing. It was beginning to sprinkle when this picture was taken and Joe noted that he was not at all prepared to ride in the rain. 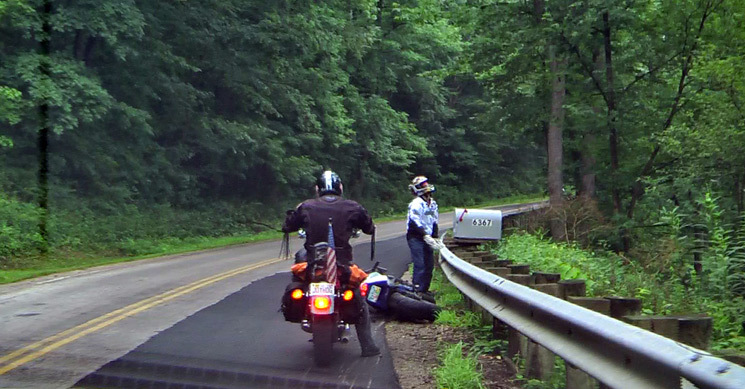 I was right behind him 11 miles into the ride when his bike let out a loud skreech and he came to a stop. Kraig Schultz notes that Joe lost his motor shaft key. As far as he went, he consumed energy at the rate of 2.6¢ per mile. That put him in the cost range with Ben Schloop, above. 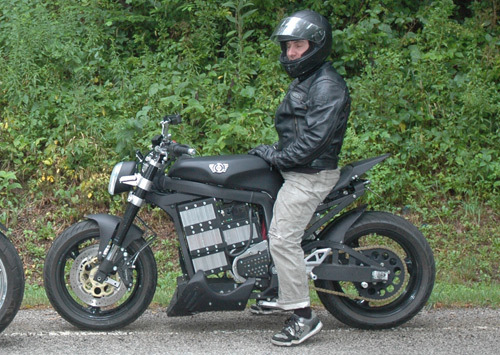 Before the Ohio Challenge, John wrote this: OutlierEV is an electric vehicle and motorcycle sales company located in Virginia Beach, Virginia. Owned and operated by Dr. John Lowitz, Optometrist. We are working in concert with a bright, enthusiastic group of 8 James Madison University Junior Engineering students under the brilliant guidance of Dr. 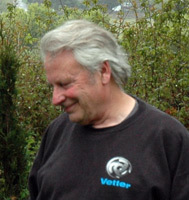 Rob Prins Phd. Our design brief; create the longest distance, most luxurious all electric motorcycle,designed, assembled and sold in America. 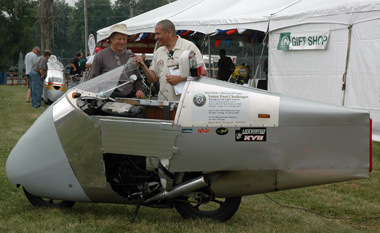 Our max speed after three new records @ Maxton Mile 97.4 mph our goal 150+ miles @ a sustained 70mph! Our current Beta model gives us hope of 70 mi @ 70 mph! Kyle Ginaven crashed his electric Challenger at mile 18. Until then he was consuming energy at the rate of 1.8¢ per mile. Noah Podolefsky came from Colorado to be one of the 2 electric bikes to finish the 40 mile course. Noah consumed electricity at the rate of 2.1¢ per mile. Do you see what I see in these electric Challengers? Craig comments: These guys have stuffed every possible space with batteries. We gas-burners would have burned less than a half gallon of gas to go their 40 miles. This is dramatic evidence of the energy of gasoline. All that battery space has the energy storage capacity of less than a gallon of gas! However... I think it is just a matter of time before the energy density of batteries is as good as gas or Diesel... maybe better. For the second year in a row, electric riders demonstrated that even without streamlining, they consume less energy in dollars and cents per mile than the very best streamlined gasoline and diesel powered bikes! Streamlining is easy to say but hard to do. Streamlining is what I do best. The rewards of streamlining will be great for electric machines. I hope that the electric Challengers begin to take advantage of this. Harvesting our energy from the sun - in the form of electricity - will eventually free our nation from the tyranny of the petroleum cartels. Converting sunlight directly into splitting water into hydrogen and oxygen would be even better. My job in hosting these Vetter Fuel Challenges is to result in solutions that allow us to live better on less energy. Our own energy. Not imported energy. My job is to make it easy to streamline. My goal is also to result in vehicles that we will really want to use. I appreciate the work of these pioneers. 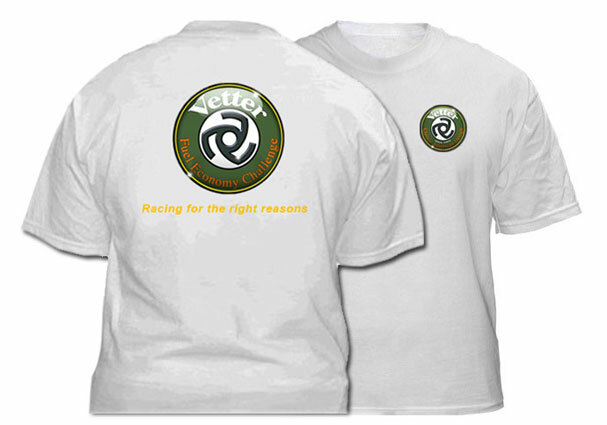 If you pre-ordered your new Vetter Challenge Shirts, you may pick them up this morning. Don't worry. We will bring extras if you didn't pre-order.